I now provide skills training in Mediation, Conflict Coaching, Peer-to-Peer Resolution support and Effective Communication via my organisation CAOS Conflict Management in the UK. Click this link if you would you like to attend the next CAOS Conflict Management 6-day Mediation Training Course in West London UK? Click on this link if you would like to train in the CAOS Model of Conflict Coaching. This is a 5 day course usually held in West London, UK and spread over a 3-day session followed by a 2-day session about 3 weeks later. 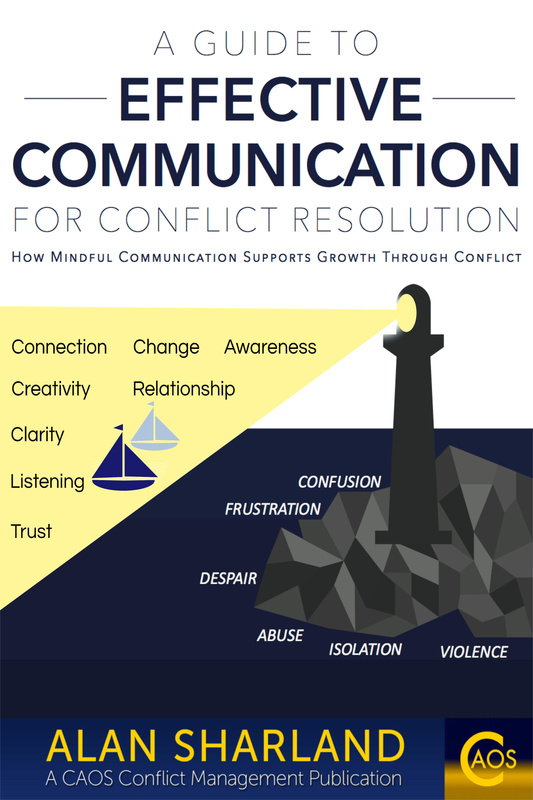 All of my training is based on the Principles of Effective Interpersonal Communication discussed on this website and is underpinned by the Underlying Philosophies of Mediation, also expanded upon within this site. This was a very successful workshop, feedback described the day as “fun”, “interesting” and “informative” with a “superb” trainer who had a “very thoughtful approach”. 100% of our attendees said they had enjoyed the course and they would recommend it to colleagues. The training focuses on exploration of the use of the communication skills of Listening, Summarising and Questioning, an understanding of the Principles of Effective Communication and looking at our approach to conflict as it arises. My skills training is highly participatory in format and is experiential, drawing upon the contributions of those present to provide the 'material' for exploration and review in order to seek more effective ways of responding or communicating in difficult situations. For specific training requests, please visit the CAOS Conflict Management website Contact Us page and submit details of your enquiry. •Brunel University - Student Complaints Department - 6 day Mediation Skills Training course. Also Managing Conflict in Teams training for staff and Conflict Coaching training for staff to provide conflict coaching for staff and students in the University. •University of Plymouth - Student Complaints Mediation Training - 6-day course as well as consultancy for the establishment of a Complaints Mediation service. The training involves individual work, pair work, group work, some games and in some workshops, art based work and dance may be incorporated. Preferences will be discussed with all clients at the time of commissioning. "I did a 1 hour workshop where I presented your Facts and Feelings Listening Exercise. We learned so much about how we listen and the consequences of not listening well that I was asked to purchase your book and have another Listening Meeting.